You’re a top executive at a manufacturing firm in a competitive industry, and your company’s decision-makers have come to the conclusion that, after examining all alternatives, a Mexico site selection initiative is the the appropriate and best option for your firm, given the location of its suppliers and the end market for its products. Faced with a tight timeline, where should you start your research? Below are two basic questions that, if asked, will get you on the fast track to your project’s completion. Q: In geographical terms, where should I locate my Mexican manufacturing facility? A: In terms of a broad brush stroke, the Mexico site selection process is put into motion by answering the “where” question. Where in Mexico should manufacturing take place to achieve the company’s goals and objectives? 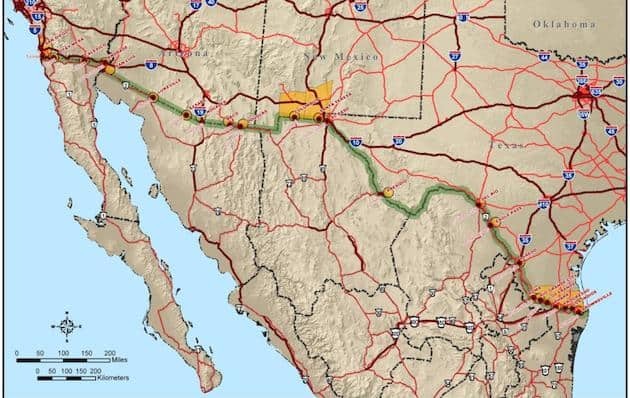 The first set of alternatives that many companies that are making the Mexico site selection journey have to consider are related to the choice between locating their facility in proximity to the border with the United States, or in the country’s interior. If the product and its market require a quick turnaround time and the keeping of large inventories is undesirable or cost prohibitive, a border location is the logical choice. If this is not the case the interior is a reasonable option. The border is the right place to manufacture large and bulky products. These items take up large amounts of space in commercial conveyances. Companies that produce things such as white goods reduce the cost of their transportation by making a Mexico site selection choice that puts them in proximity to the border. When products are small, and many can be shipped in a single trailer load, the interior can be a suitable, or preferential, location option. Mexico site selection is often driven as a result of the location of existing industry specific clusters. For instance, automotive industry OEMs and suppliers are increasingly prone to migrating towards the Bajio region of South Central Mexico, which includes the states of Puebla, Guanajuato, Aguascalientes and Jalisco. Aerospace manufacturing firms are in high concentration in states such as Chihuahua, Queretaro, Sonora, Nuevo Leon and Baja California. Medical device manufacturing, although not exclusive to Baja California, is found in large concentration there. Q: How should my manufacturing be executed? Is a subcontract arrangement, working in partnership with a Mexico shelter service provider or opening a wholly-owned foreign subsidiary correct route to take? A: Manufacturers whose volumes do not require a large amount of labor to build their products, or have small volumes of output, are often best served by entering into a contract manufacturing arrangement with a Mexican service provider. Cost savings in Mexico are primarily achieved by economies of scale generated by the use of large amounts of labor. Without a sufficient labor requirement, setting up independently controlled operations may not be economically justifiable. Companies that wish to have complete operational and managerial control over their manufacturing workforce, processes, quality and shipping schedule might find partnering with a Mexico shelter service provider to be most suitable for its needs. Shelter companies in Mexico handle all non-core, but critical functions that a manufacturer needs to run a shop in-country. Their services allow manufacturers to focus completely on the production mission that is its reason for setting up in Mexico in the first place. Lastly, companies whose culture is dominated by the need to control all aspects of their operations may find themselves most comfortable choosing the option of creating a wholly-owned foreign subsidiary, alllowing them to control everything related to their Mexican plant from A to Z. There are of course a myriad of other questions, variables and considerations to address during the Mexico site selection process. Beginning by addressing the two aforementioned issues, however, will get your project moving on the road to a successful completion.